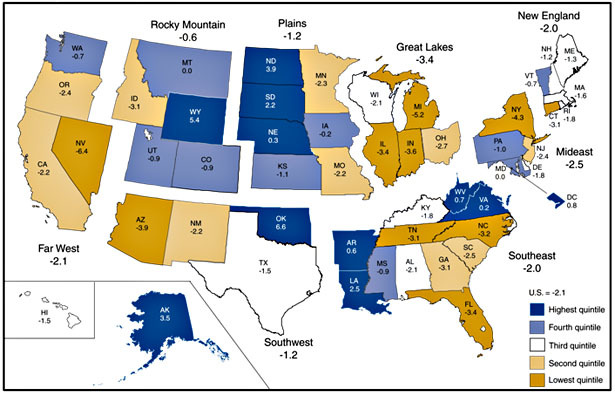 Via Ryan Avent, here’s a nice map from the BEA showing which states are recovering best from the recession. It’s all 2009 data. I suppose I can take some cold comfort from the fact that California isn’t actually at the very bottom of the list. In fact, we’re about 20th from the bottom. That’s a little surprising given the depth of the housing crash here and the parlous state of our finances. In less surprising news, Nevada has the worst performance, but longer term it’s Michigan that’s actually in the worst shape. Ryan has more at the link, including the Texas-California comparison that everyone is dying to see.